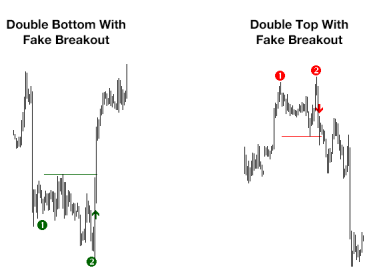 In this article you will learn how to spot trading setups within trends with an extremely strong momentum. These setups are entered during the strongest momentum of the trend at the first pullback. A perfect momentum setup exists if the indicator values of the Perfect-Trend-System (PTS) and the movement of the price are signaling a continuation of the strong trend with highest probability of success. You enter only during the first pullback. We will now examine these criteria in detail. The success rate and profit potential of your trend-based trades directly correlates with the momentum/strength of the trend. 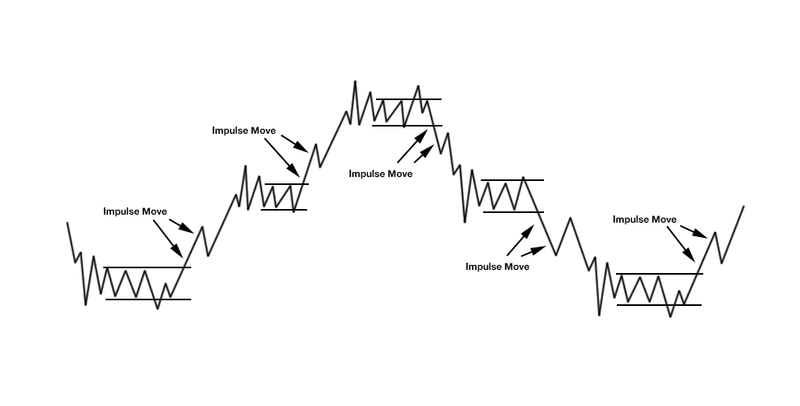 Every strong trend on every timeframe begins with an impulse move which drives the price out of a smart money accumulation area (Wyckoff cycle). The following picture shows the Wyckoff cycle in detail. The smart money is the driving force in every financial market. And it operates in a never ending cycle of position accumulation and profit release. These operations create the Wyckoff cycle. 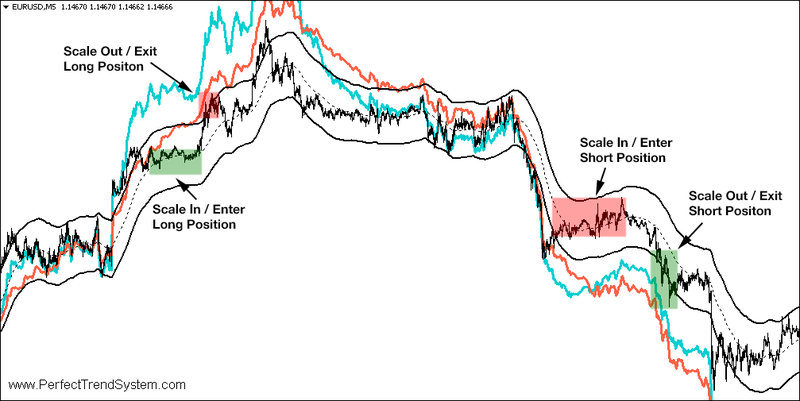 The accumulation phases are usually price ranges on the chart with stop hunts above recent highs and below recent lows. 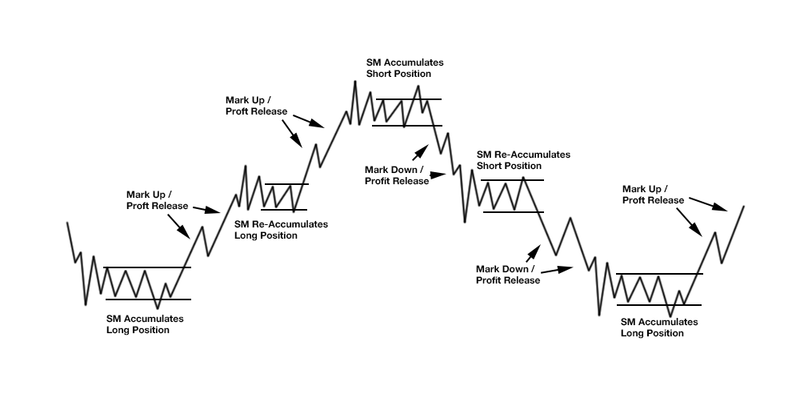 The profit release phases are the strong and fast moves which drive the price out of an accumulation phase. A trend based trader can only make money if a trend is established and trends only emerge if the smart money starts a profit release phase. In addition, a trend based trader should jump on a trend as soon as possible. Therefore, the most logical places to enter the market as a trend based trader within the Wyckoff cycle are those which are labeled with the green and red circles in following picture. Every trend based trader and especially every Wyckoff-trader is facing the same problem: Has the trend (the profit release phase) started and will it continue? The PerfectTrendSystem will give you the answer with 80% accuracy. The PTS measures the momentum of the impulse move which drives the price out of the accumulation zone which are labeled in following picture. The strength of the momentum of the impulse move is directly correlated with the probability if the trend will continue or not. With the simple 4-step rule set of the PTS you can participate at the trends which will continue with 80% probability. The PTS is especially created to measure the momentum of this impulse move. And the PTS signals you whether you should jump on this newly emerged trend when the first pullback phase occurs. Following chart shows an example. The accumulation area is the area of the chart where the smart money accumulates its own position (long or short). The strong impulse move to the downside reveals that the smart money has accumulated a short position and that the smart money has started the profit release phase. The smart money is now interested in lower prices until it has completely sold its short position to the rest of the market participants. The Perfect Trend System tells you whether you should jump on the trend or not. The PTS does this by analyzing the momentum of the trend on two higher timeframes. If the price action and the values of the PTS are signaling a perfect momentum setup then the trend will continue with 80% probability. The 80% probability is the edge you will have with the PTS. Of course, the winning percentage of your trades depends on the trading style (stop/target placement, manual intervention during the trade etc.) that you choose for your trading with the PTS. How does the PTS tell you whether you should jump on the trend? The PTS has a unique way to measure the momentum of the trend. The results of the measurements are expressed with the blue and the orange lines of the indicator. The blue and the orange lines are telling you where the price should be according to the momentum of the preceding move. 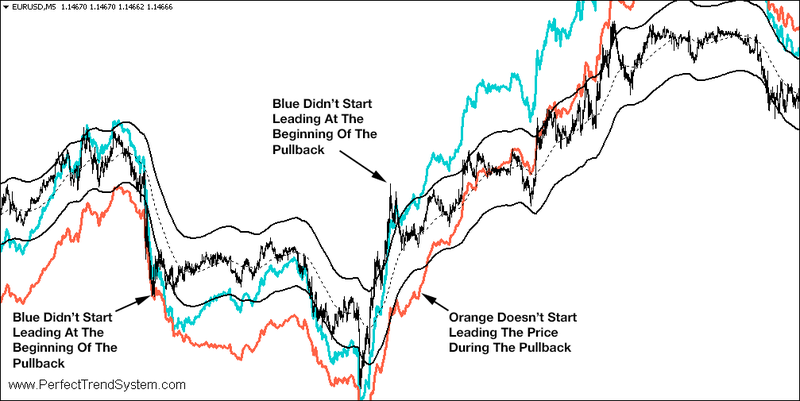 By comparing the price action and the values of the blue and orange line you can objectively decide if a perfect momentum setup exists or not. The value of the blue line is calculated from the next higher timeframe than the timeframe of the actual chart. 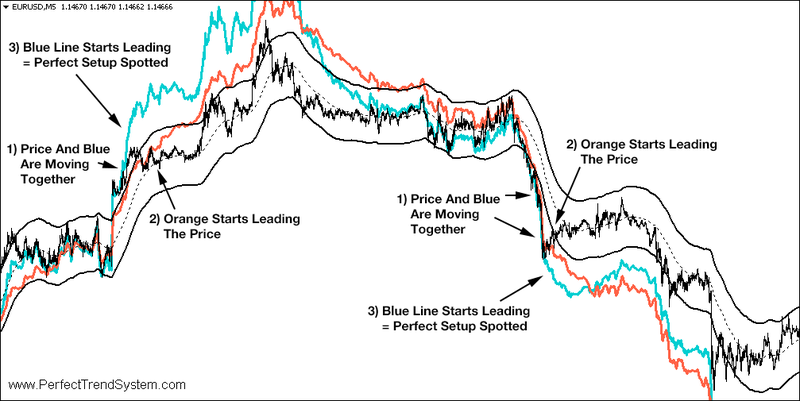 The blue line is the most important line to detect a perfect momentum setup. The orange line of the PTS is calculated from the timeframe that is 2 times higher than the timeframe of the actual chart. 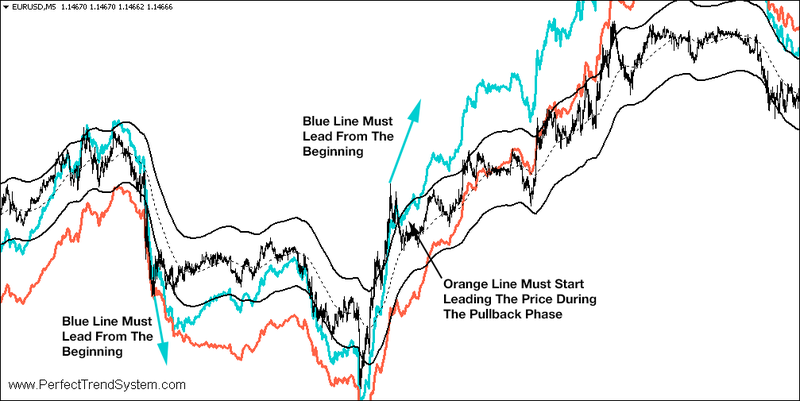 The orange line is used as a confirmation if the blue line signals a perfect momentum setup. A fast downward move of the price occurs (the impulse move). The blue line moves with the fast moving price. On the chart it looks like the price and the blue line make exactly the same move. If the orange line isn't leading the price at the beginning of the pullback, then it should at least get leading during the pullback. This indicates that the two times higher timeframe agrees with the direction of the impulse move. As soon as the movement of the price gets slower or the price makes a pullback to the upside the blue line makes lower lows. The blue line is now leading the price. Is a support/resistance area of the bigger picture in front of your trading direction? If not, great, you found a perfect momentum setup! How To Trade A Perfect Momentum Setup? There are many ways to trade a perfect momentum setup. Following examples are only 3 possible ways of many more. Scaling in on limit orders with a wider stop as soon as the perfect momentum setup is spotted. Placing one big market order with a wider stop as soon as the perfect momentum setup is spotted. Waiting for the end of the pullback and entering at market with a tight stop, when you think the trend resumes. You can really choose your preferred trading style. All ways will be profitable because the edge comes from the perfect momentum setup and the trend will continue with 80% probability. I use some sort of "scaling in method" with limit orders because then all my orders will be filled at a very good price and are usually very early in profit. I have developed an Expert Advisor for exactly this trading style. The EA manages the trade entry for me. All I have to do is spotting a perfect momentum setup and then activate the EA. I can then leave the chart because the Expert Advisor manages the trade. I offer this EA with a 1on1 Coaching where I will teach you the usage and how you can back-test the PerfectTrendSystem. 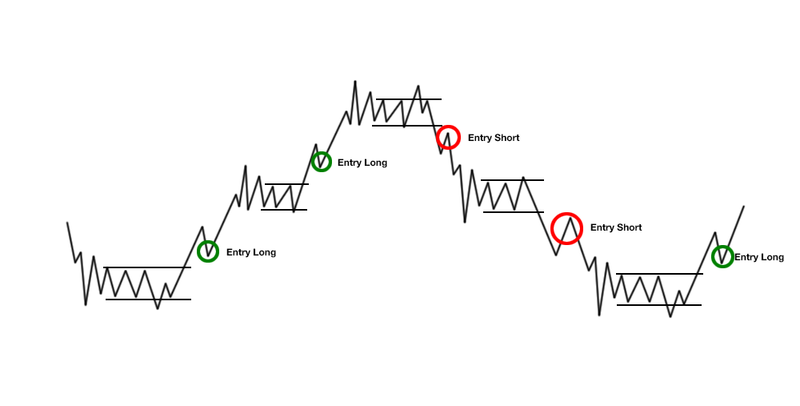 Following chart shows how you can scale into a short position. As soon as the perfect momentum setup is detected you can enter with the first partial position. At higher price (during the pullback) and/or if the price comes closer to the dotted moving average then you can add to your short position. The PerfectTrendSystem is especially created to jump on trends with a strong momentum during the first pullback. 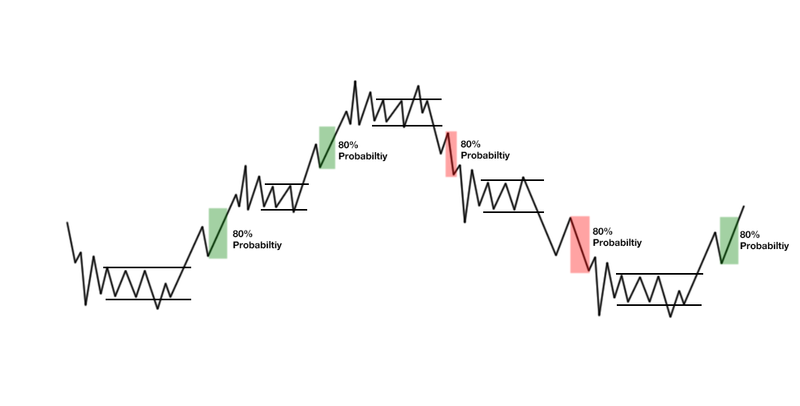 You will have the highest winning percentage if you exit during the continuation move of the trend after the first pullback. I suggest trading only the first continuation move, especially at the beginning when you start using the PTS. After the first continuation move which occurs with 80% probability the trend can resume or even reverse. But if you are interested in holding the trade longer and riding the trend through multiple pullback and continuation moves, then you should visually analyze the bigger picture of the chart. You should, for instance, check if support/resistance areas are in front of your trading direction and then judge if a bigger continuation of the trend is probable or not. The following chart shows two examples when you should not enter the market. Although both trades (short and long) would have ended as winning trades the filtering rules of the PTS will keep you out of a lot of losing trades. You will only have the 80% probability if you obey the 4 simple rules described above. On the left side of the chart you can see a short trade setup. But the setup was filtered by rule number 3. The blue line didn't start leading the price exactly in the moment when pullback phase began. The blue line started leading anywhere in the middle of the pullback phase. So this trade was discarded. The blue arrows in following screenshot show the necessary movement of the blue line to give valid perfect momentum setups. Also the correct position of the orange line is labeled in the long setup example. All versions of the PTS (the FREE-version too) can do visual forward testing in the strategy tester of MT4. By doing your own visual forward testing on any liquid trading instrument like forex, futures and indices on every timeframe your can convince yourself that the mechanical rule set which I have described above simply works. The following video shows how I use the PTS to spot the perfect momentum setups which have 80% probability of success. You will see that the rule set produces valid and invalid trading setups. All valid setups shown in the video were winning trades. You will also see that all good impulse moves drive the price out of some type of a smart money accumulation zone.